Full bodied yet still fresh and vibrant, this is a blend of 30% each Bourboulenc, Marsanne and Viognier, plus 10% Clairette. Hints of lemon curd impart a lovely texture, while the aromas and flavors lean toward pineapple, melon and citrus. The white wines of the southern Rhone Valley are escalating in terms of quality and popularity, offering chardonnay-like richness but with added exotica thanks to the blend of varieties that can include roussanne, marsanne and viognier. 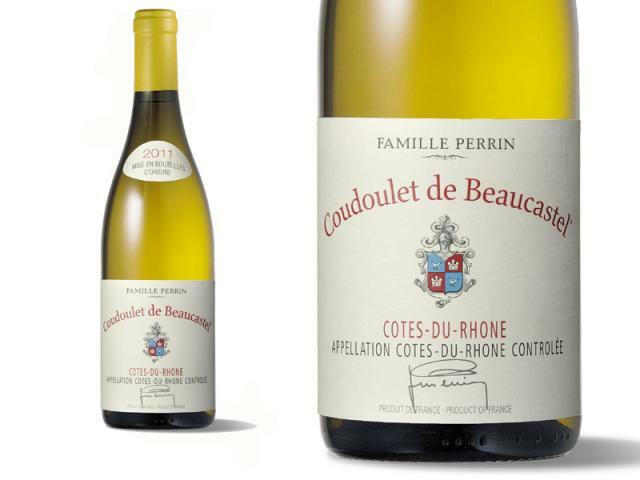 The genre hits its apogee with the grand whites of Chateauneuf-du-Pape, but there are some great values from “lesser” appellations, including this terrific wine from the Perrin family that owns Chateau de Beaucastel. A light whiff of brioche weaves around a core of plantain, macadamia nut and lemon zest flavors, followed by a honeysuckle hint that chimes in on the finish. The Beaucastel 2011 Côtes du Rhône Coudoulet Blanc, which comes from vineyards adjacent to Châteauneuf-du-Pape, is a difficult wine to find in the marketplace, as the red Coudoulet is far more abundant in quantity. That being said, the 2011 Coudoulet white is an equal part blend of Viognier, Bourboulenc and Marsanne and the balance of it 10% Clairette. Always showing lots of good freshness, purity, hints of apricot and white peaches, this wine is flowery and very well-made in 2011, which is a strong vintage for white wines. Associant viognier, clairette, marsanne et grenache blanc, c'est un beau vin rond, sans lourdeur, à l'allonge fraîche.